This mod add compatibility AE & Thaumcraft. In this moment mod have only Arcane Terminal. - Post it on Issues page! - Feel free to use this mod in your modpacks. I want updated this mod. I need more time. Nice little compact mod. 👍 I'm looking at your images and does the terminal just have to be touching the Workbench Charger for it to have an effect? Pretty late-game in Thaumcraft and I'm encountering the vis capacity problem. Thanks. Place terminal on upper side of Charger. Not work for other 5 sides. Interesting. Good to know and thanks for your speedy answer! Is there any way to get this to work with the workbench charger? Right now late game recipes are unaccessable because you can't get enough vis in a single chunk. If it's not available now, maybe add a slot in the terminal to put a workbench charger, to allow it to access the surrounding chunks? 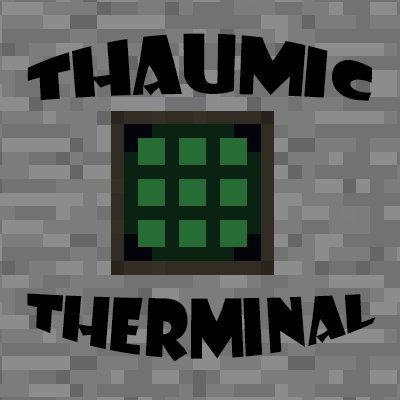 For temporary variant use this -> https://minecraft.curseforge.com/projects/thaumic-terminal/images (Screen Arcane Terminal Charger). Are you going to fully recreate the main functionality of Thaumatic Energistics? Mod ThaumicEnergistics have official port. Not from me. the version of this mod i have installed is 1.0.4.
is there a newer version of which i am not aware or is this a mistake? Woops. Its my mistake. Fixed. 1.0.5 can't be installed from Twitch (probably because the file isn't set to Release status? ), only 1.0.4 (which doesn't work with servers). will you be adding refined storage compatibility to thaumcraft as well? May be. In this moment I not planned. It's an expression from a batman movie, the Dark Knight. Means you did something so useful we probably haven't earned it. It's a compliment for great work.